This was the webpage most of the Indians using today were greeted with for most part of the afternoon. For today's outage, though Google issued a statement saying only 0.75 % of the total user of Gmail were affected. It also added that most of the users were from India, Middle East and South East Asia. However the downrightnow.com graph is for the whole world as per my knowledge. Besides Gmail, Twitter and Facebook users had faced the disruptions last week but both the social networking companies worked them out. Facebook took 90 minutes to sort its problems out and Twitter took half an hour. Hope Gmail has now sorted out the servers issues it is facing and continue giving us the best of the services in years to come. indeed gmail is quite popular in India and worldwide...their server going down means serious loss for many ! mysay.in did you get caught the outage, I was offline for 2 hours bcoz of it. Interestingly mine was working alright. 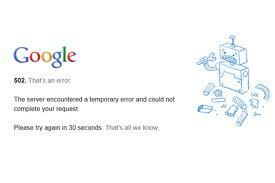 I check my Gmail every now and then, but never saw this error page today. Sourav, the Google said that few people were affected by the outage and maybe I was out of the chosen few. However how do you explain the blip in the downrightnow graph which is for full world. Downrightnow uses users' report, Twitter updates and official announcements to show whether a site is down or not. So as it was down in most parts of India, along with many other parts all over the world, it showed that Gmail was down, which it was for most regions. But fortunately, I didn't face it.